• Wednesday: Gov.-elect Jay Inslee and other statewide officials elected in November are sworn in, and Inslee makes his inaugural address. 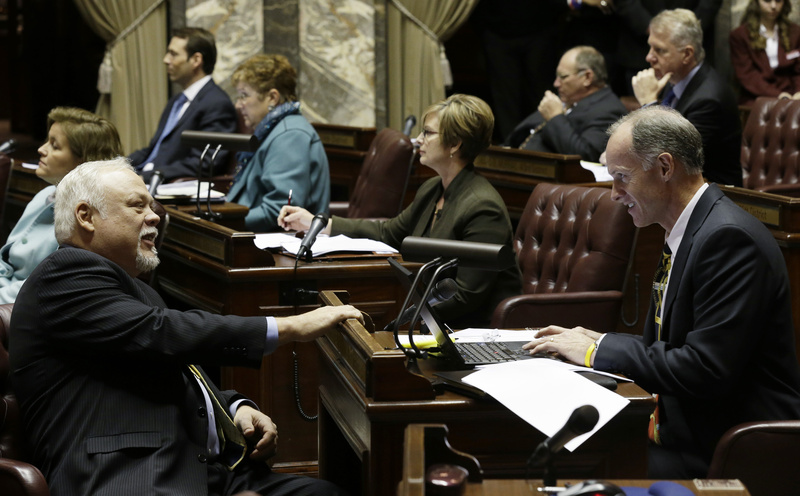 OLYMPIA – With a Republican-dominated coalition in control of the Senate, bills involving abortion rights, environmental protection and gun control may have little chance, minority Democrats said Monday. As expected, a coalition of 23 Republicans and two Democrats seized control of the Senate during Monday’s opening session, passing their rules for shared governance over a rival plan by the chamber’s 24 other Democrats. “We will concentrate more on policy than politics,” said Sen. Linda Evans Parlette, R-Wenatchee. Minority Democrats countered the new lineup means some legislation they think a majority of state voters would support won’t even get hearings. Across the Capitol Rotunda, the House of Representatives began its session with less drama. Democrats are firmly in control of that chamber and re-elected Frank Chopp, of Seattle, as speaker. A coalition led by Sen. Rodney Tom, D-Medina, became the Senate’s majority caucus on a 25-23 vote, passing rules that give them control of the chamber and committee chairmanships. By offering to let Democrats name chairmanships of six committees, and co-chairmanships on three others, they contended they were seeking cooperation and collaboration. The coalition plan puts that group firmly in control of the two most powerful committees – Ways and Means, which writes the budget, and Rules, which decides which bills that pass other committees come to the floor for a vote. Democrats countered that they had the true bipartisan plan: have co-chairmen and equal numbers from each party on all committees. That proposal failed on a 23-25 vote. The Senate has 49 members, but one seat was vacant on opening day because former member Derek Kilmer was elected to the U.S. House of Representatives last fall. His replacement, who by law will be a Democrat, hasn’t been chosen. Both sides accused the other of practicing the politics of Washington, D.C., perhaps the ultimate insult in Olympia. Sen. Kevin Ranker, D-Bellingham, said the coalition-led Senate dominated by Republicans might not reflect the state as a whole, which supports abortion rights and is “pro-environment.” It might also shut off any “thoughtful dialogue on gun control,” he said. Sen. Ed Murray, of Seattle, the Democrats’ minority leader, said he’s been told there will be no hearings on a possible assault-weapons ban or on the so-called Reproductive Rights Parity Act, which would require every insurance plan that covers live births to also cover abortions. Although members of the Democratic minority generally denounced the coalition plan, three did accept a chairmanship or a co-chairmanship being offered by Republicans. Sen. Steve Hobbs, of Lake Stevens, said he remains a member of the Democratic minority but agreed to be chairman of the Financial Institutions Committee, which he has led for the past two years. He said he didn’t promise majority Republicans anything in return for the chairmanship. After House members were sworn in, Chopp told representatives they needed to make a “significant down payment” on better schools. Those who call for reform should look to providing all the money needed for basic education and health care for the uninsured and encouraging more voter participation. Rep. Richard DeBolt, of Chehalis, the Republican leader, said his caucus would focus on three things: setting the state budget for education before all other spending is considered, increasing jobs around the state and giving Washington a budget that can be sustained for years to come. “We can’t cave to special interests. We can’t pick winners and losers,” DeBolt said.